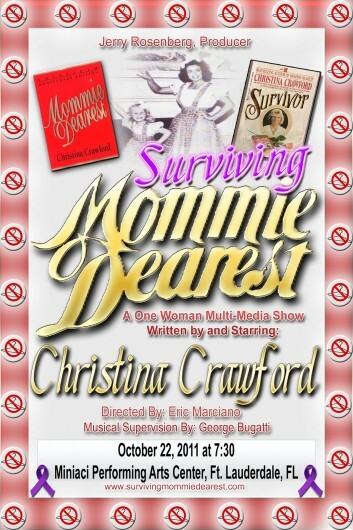 “Surviving Mommie Dearest,” a new one woman multi-media show written by and starring Christina Crawford, is based on two of her best-selling books, Mommie Dearest and Survivor, The two-act play will feature long-forgotten home movies, historical archival photos, pictures from private collections, film clips and video interviews of both Joan and Christina Crawford. The play covers almost 100 years of entertainment and show biz history. The production is approximately two hours, including an intermission. The play is produced by Jacksonville businessman and owner of the world famous Metro Night Club, Jerry Rosenberg. Directed by award winning New York filmmaker, Eric Marciano, of American Montage Films. The musical supervisor is singer-composer and American Songbook oficionado, George Bugatti. This is a pre-broadway showcase. Venue: Miniaci Performing Arts Center, NSU main campus. Visit www.miniacipac.org.